Rockstar Games has always been one of the most prestigious game developers to date with many quality titles and series like Grand Theft Auto, LA Noire, Max Payne, and Red Dead. If you are fans of Rockstar Games, at the very least you definitely know their most famous franchise Grand Theft Auto – GTA with the most recent Grand Theft Auto 5 – GTA 5. If GTA franchise tells about stories of gangsters and professional criminals of the modern world, Red Dead Redemption tells the story of a former outlaw of the Wild West back in 1911. Since the main star John Marston has already died by the end of the game, many people were wondering how the story would continue. And now we have it: Red Dead Redemption 2. What should we expect from this new title? Let’s find out! For those who have not heard of Red Dead Redemption, it was a sequel of the Red Dead series, released on 2010 for PS3 and Xbox 360. It was among the best games of 2010 and needless to say, Rockstar built a really wonderful open-world with impressive visual (by 2010’s standard), extremely fun gameplay, and especially emotional storyline. Red Dead Redemption tells the story of an outlaw named John Marston who was ordered to hunt down his former gangs if he wanted to gain amnesty for his past crimes. As we enjoyed the story, we got to see more of John Marston’s dark history and why he sought “redemption”. The shining point of Red Dead Redemption’s story is not only about its excellent writing but also its fascinating characters. Most characters in this game are so memorable besides our main protagonist John Marston. Who can forget the despicable director of the Bureau of Investigation (BOI) – Edgar Ross or the “Robin Hood of insanity” – Dutch van der Linde? 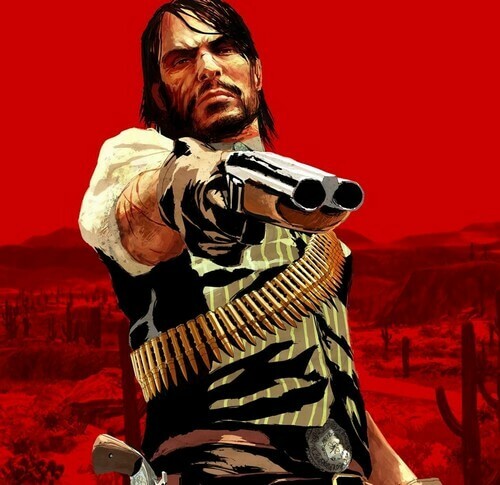 As mentioned, the main protagonist John Marston died at the end of Red Dead Redemption, thus leading players to think that Red Dead Redemption 2 could tell the story of his son Jack Marston. However, with the Red Dead Redemption 2 Official Trailer 2, things are much more surprising than what we initially thought. So with no further ado, let’s see what we know about this next game so far! This is probably the biggest surprise for all of us, especially after all our theories about John Marston’s son – Jack Marston. Red Dead Redemption 2 will bring us to the timeline before what happened in Red Dead Redemption, which means we may have a chance to see John Marston working with Van Der Linde gang. Judging by Dutch van der Linde’s portrays from both the original Red Dead Redemption and the recent trailer, we can clearly see the striking resemblance. 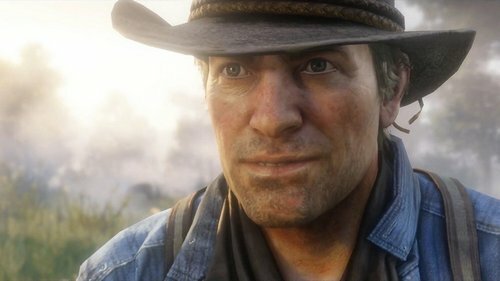 Dutch from the trailer looks much younger than the first game, which highly emphasizes the timeline of several years prior to the original game. “So wait a minute! Are you saying we may see John Marston?” Exactly! And the reason is: in Red Dead Redemption 2 we are going to play as a new protagonist: Arthur Morgan. Although most of us are probably familiar with Van Der Linde gang from the first game, let’s remind us all that we do not really know much about this gang back to its former glory. Since Red Dead Redemption took place after the gang had disbanded, we did not really know all of the gang’s members except for its leader Dutch, Bill Williamson, Javier Escuella, the protagonist John Marston and possibly his wife Abigail Marston who hung with gang for a certain time period. Luckily, this prequel presents us a brand new protagonist named Arthur Morgan who seems to be a senior member of Van Der Linde gang. 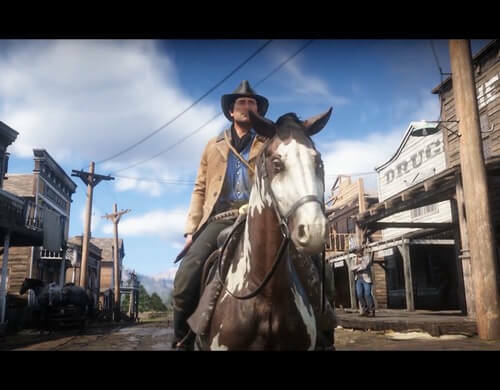 In the trailer we clearly saw Dutch asking Arthur: “Do you have my back?” and Arthur replied “Always Dutch”, which strongly tells us that these two guys has been “buddies in crimes” for a very long time. Besides being a member of the gang, Arthur also seems to be a really, really *sshole who is wanted in 3 different states. But seeing his actions from the trailer, such a wanted man is quite… understandable. Right off the bat, Rockstar presented to us an unlikable-vibe guy who has no problem in kicking someone to wake him up and immediately “ask” for money. He readies to bully a young man even when his father died just recently. He seems to be a “professional criminal” who have already done tons of robberies and heists. Clearly he is a bad-guy type and if you enjoy outlaw life then you are probably going to have good times with Arthur Morgan. It’s unclear how the “redemption” theme will fit in this game but let’s just wait for its official release this year 2018. The map is gonna be huge! The original Red Dead Redemption featured 3 major territories: New Austin, West Elizabeth, and the Mexico’s region of Nuevo Paraíso. All of these 3 regions are impressive in their own rights; each comes with various locales and activities. And in the upcoming Red Dead Redemption 2, players can expect a much bigger open-world with whole lots more things to do. 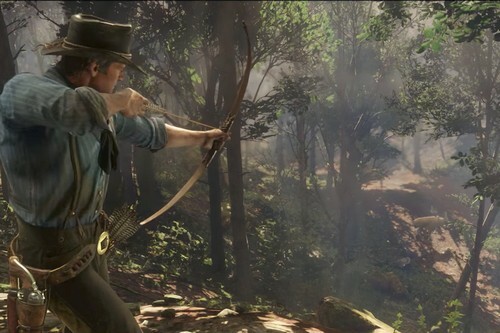 According to the trailer, Arthur said the following: “We got lawmen in three different states after us… They chased us from the West; they chased us over the mountains.” This quote already hints that there will be 3 states available in-game for players to explore, just like the previous game. However, based on what Rockstar did with the big blast Grand Theft Auto 5, we can expect this new open-world to be at least on GTA 5’s world level or even bigger. 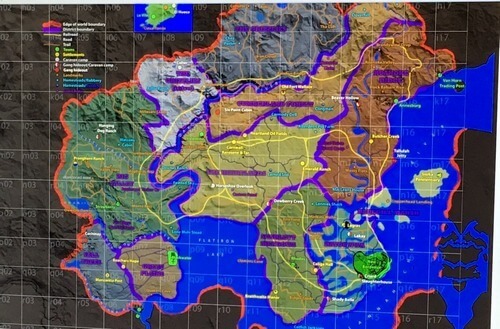 People around Internet has already shared a map which supposedly to be the leaked world map for this Red Dead game. And by the look of it, the world of this game is going to be truly huge! Obviously the game takes place in America and therefore, some people have already been trying to speculate the 3 real-life states used for the in-game version. For example, according to Polygon, the 3 states used for preference can be: Texas, Louisiana, and Arkansas where the Ozark Mountains lies (which actually makes sense with the snowy mountainous area in the trailer). But nonetheless, Rockstar are truly skilled artisans when it comes to open-world building and no matter what real-life locations used for reference, we can expect lots of good things from them in terms of world creation. Bows and Dual-wielding, who would have thunk? In such a world full of firearms and other destructive stuffs, who would think of using bows into a fierce gun-fight? That said, many fans still wants to see bows and sadly, such awesome weapon was not featured in Red Dead Redemption. But good things: it seems Rockstar decided to bring it back in Red Dead Redemption 2. To be honest, we do not really believe that outlaws or bandits will find any use for a bow. However, for the sake of gameplay, being able to use bow is still a welcoming addition especially when you can use it for stealth kill or hunting. Other extremely cool thing we may see in this new title is dual-wielding. 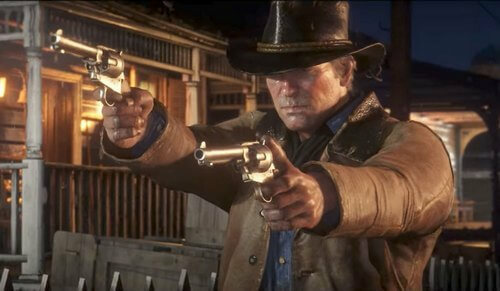 We have already seen Arthur wielding 2 pistols and it will be outstanding if we can do it in game. Personally, we would love to have fun experience with dual-wielding like what they did with Call of Juarez Bound in Blood or Call of Juarez Gunslinger. Of course the experience which Rockstar provides may be different from what we have mentioned but let’s just hope that it will feel just as badass as that. Hunting is back! With alligators and bears! In Red Dead Redemption, hunting is not an obligatory objectivity although it does provide players tons of money. And in Red Dead Redemption 2, hunting will surely return with more variety of animals and species such as alligators and bears. Back to the previous game, hunting is quite a fun activity as players can hunt from 36 different kinds of animals for various materials like furs, skins, antlers, hides, teeth, pelts, claws, fangs, and more… These materials can then be sold in different locations for different amount of prices. However, we are kind of expecting for more in this new title. For example, hunting materials should be able to be used for crafting stuffs rather than selling for money only. It would be really fascinating if Rockstar can put such mechanism in the game. Heist in Wild West style? Heists have been a core element of Grand Theft Auto 5 and suffice to say, they provide the best moments in GTA 5. It allows us to take part in everything to make a heist success from planning, choosing participants, and conducting it. 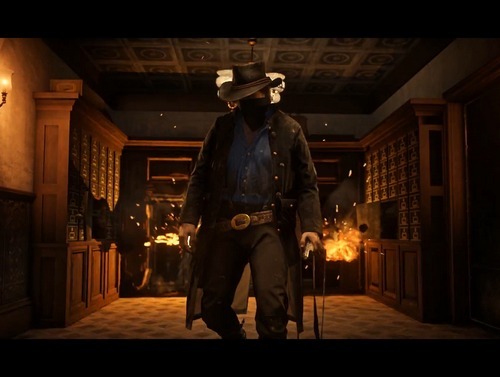 And so in Red Dead Redemption 2, fans have been speculating that we are going to see heists once again and this time it will be Wild West style. If it does come true, we’re game! In fact, the second trailer actually seems to spoil a bit of this for us with the train and bank robbery scenes. Furthermore, robbery has always been an important thing in all classic Wild West stories and what can be a better time to implement in game than Red Dead Redemption 2? And that’s it folks! What is your opinion about Red Dead Redemption 2 so far? And don’t forget, the game is going to be released this year in 2018! For now, thank you and stay tune for more news in the future!